I love spending a little of my time each day on Craigslist searching the artist and free section. 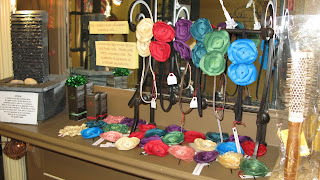 I came across an ad to sell your handmade items in a Eco-friendly salon in Providence, RI. I've been making some new ha ir accessories and thought it would be a perfect fit. I met with the owners Billy and Yvonne of the "Gallery Salon" and they were really nice and the salon was amazing. They gave me a perfect spot on a fireplace mantel to set up shop. I've had them in the salon for about two months and they have done really well. The hairdressers have even sold them right off their heads. 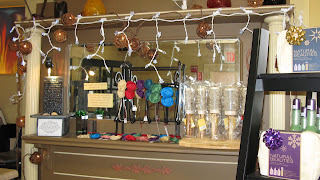 Who would of known to sell your handmade items in a salon instead of a store. 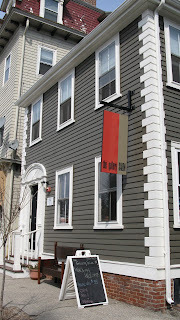 The "Gallery Salon" is located at 91 Hope Street Providence, RI 02906. They're a natural Eco-friendly salon with friendly stylist in a cozy comfortable atmosphere. This is a great post showing your fabulous business-sense, Beth. Well done! Great idea! One of my friends who creates jewelry does this also -- she sends necklaces, bracelets and earrings to a hair salon owner she knows in Maryland, and they promote her items in the store in exchange for a small commission. It's been great business for her. Congrats on the business development! Thanks for the comment ladies. I'm really surprised on how well this worked out for me. I'm actually looking into other salons to at least put my hair accessories in. Jenny they do take a very small commission and it's a way better one then other stores I'm in or hear about.